It started as a one-race invitational in 1972. Then it became a springtime warmup series, a three- to four-race dash through the month of March. The first race was called the Super Bowl of Motocross. The first championship received the name Yamaha Super Series of Motocross. Magazines later referred to it as a completely new discipline of dirt bike racing: stadium-cross, then Super-cross and, finally, supercross. At first, riders wore the numbers they earned from the previous year’s motocross standings. The Super Series title didn’t seem to hold much weight. The early races at the Astrodome hosted the Texas High School Motocross Championships on the same track that Jimmy Ellis and Jimmy Weinert had blasted around the night before. Was supercross the future of dirt bike racing in America, or a watered-down version of motocross? Opinions depended on the persons asked. Whether they liked it or not, the riders continued to show up, and so did the spectators. Nobody knew where any of it was going, but they knew they didn’t want to miss it. In 1972 at the Los Angeles Coliseum, Pete Szilagyi of Dirt Bike magazine watched a group of spectators walk up to the ticket gate with beers and coolers full of, probably, more beers. “What do you mean we can’t come in with these?” the dumbfounded revelers asked the agent at the turnstile. “This is a motocross race!” But was it? “It’s motocross but it’s not,” wrote Michael A. Brown in the July 1975 issue of Cycle World. In the early 1970s, American dirt bike enthusiasts were still absorbing the thrills that this European imported activity gave them. At some point, the series stopped being thought of as a warm-up, the champion wore his own No. 1 plate, and the whole thing stopped being thought of as motocross in a stadium. Supercross is supercross. Motocross is motocross. Yet, since 1974, the Monster Energy Supercross and Lucas Oil Pro Motocross Championships have co-existed, exchanged calendars and shared talent. They’re the same but very different. The sports are like parents who love both of their children equally but differently. The supercross championship turned 45 in 2019, and while the tracks have changed, the bikes certainly have evolved and the racing format has been tweaked, the spectacle, the vibe, the “show” stayed consistent. 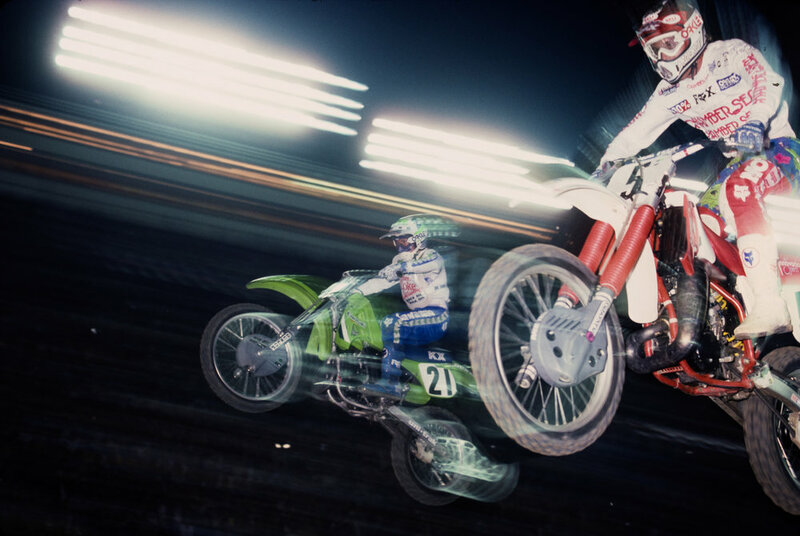 In 1978, Dave Hawkins titled a Cycle article, “Circus Time at the Stadium” and used his 4,000 words to interview riders and teams about the evolution of this new series that, by that point, had hit 11 rounds in eight cities. It’s fitting that in 2009, Feld Entertainment, operators of the Ringling Bros. Circus, took over as the promoters and producers of supercross. “Well, what is supercross?” he asks back. To not accept change in supercross is to not accept supercross at all. Supercross is a uniquely American invention, a Hollywood-ized version of motocross. It exists solely because people who loved motocross wanted to share it with, and make it accessible to, more people. And, of course, make money. But a lot of money is shelled out before any is made. At the first Super Bowl of Motocross, promoter Mike Goodwin detailed his costs to several reporters: $28,000 to truck 4,000 cubic feet of dirt in from 15 miles away, $35,000 on promotion, $40,855 to complete the course. Curiously, the rental fee for the LA Coliseum was not a part of any of the conversations. For 45 years, promoters have spent time and money trying to entertain beyond the racing. 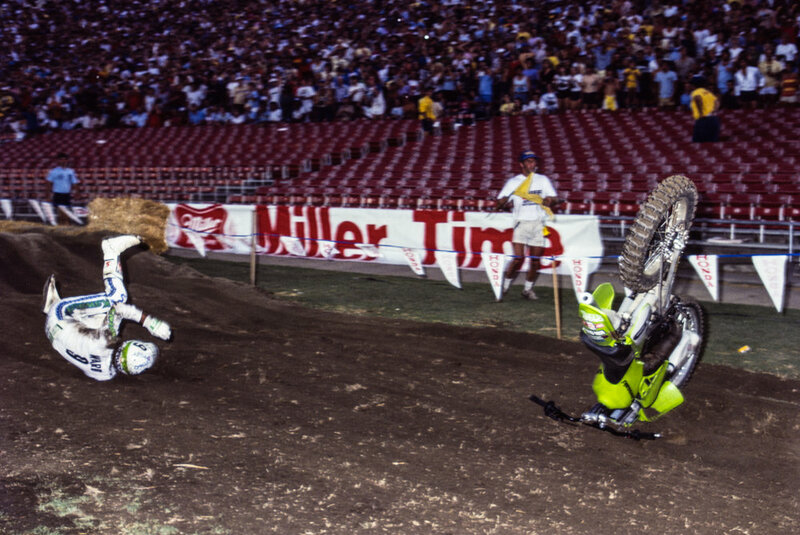 Supercross sideshows have included a daredevil with a hang glider attached to a motorcycle, wheelie experts, dog races, blindfolded foot races, the sphere of death and a woman who climbed into a Styrofoam box and blew herself up; she called herself Dynamite Lady, of course. The longest running exhibition/sideshow, however, is easily the KTM Jr. Supercross Challenge, a 50cc race featuring 15 kids aged seven or eight on identical KTM 50 SX mini bikes. This proves something significant. Spectators might appreciate a guy who can ride a wheelie around the entire track or a woman who blows herself out of a box, but what they really want to see is good racing. The exhibition with the kids is endearing, but it doesn’t provide a path to winning 450 main events 15 years into the future. To be fair to KTM and Feld, that isn’t the intent of KJSC. In 1987, with Jeff Ward and Ricky Johnson looking on, I rode my Kawasaki KX60 in a two-lap intermission race at the Pontiac Silverdome. The wall-like jump faces and the tire-eating whoops scared the hell out of me, if anything. In 2011, Feld Entertainment introduced the Monster Energy Cup, a one-off race on a hybrid supercross/motocross track (in and around Sam Boyd Stadium). The format tested out a three-main-event structure, each 10 laps in length. Lowest score after the three races is declared the overall winner. In between those main events, amateur kids in two different classes (Super Mini and All-Stars) competed, as well. The All-Stars division featured promising young riders on full-size 250 four-stroke motorcycles. This class exposed a developmental hole in the sport that most people already knew about but didn’t act on. In 2018, Feld introduced “Supercross Futures,” a series of Sunday amateur races on a tamed-down course in the same stadium where Ken Roczen and Adam Cianciarulo raced the night before. In 2019, the top three riders from each of the 26 classes will be eligible to compete in the Supercross Futures AMA National Championship on Monster Cup weekend in October. Feld shut down the Amsoil Arenacross championship last May. A series that’s often called a minor league feeder system, it really wasn’t. 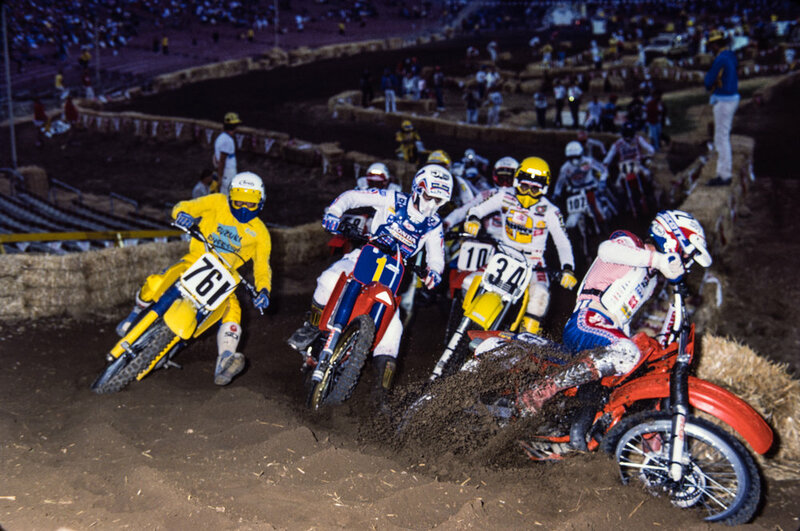 Going back to 1986, the inaugural season of the championship, not a single rider “graduated” from arenacross to become a supercross champion in either the 250 or 450 divisions. Not a single Arenacross champion scored even a 450 main event win. Arenacross provided an intense racing experience but had a very out of sight, out of mind feel. Supercross Futures is the first true feeder system for supercross, a series that has chewed up good talent—especially riders raised exclusively on motocross tracks—with early career injuries and an inability to quickly adapt and learn the craft of racing in a stadium. At $105 a class to register for SX Futures, $30 for a mechanics pass and $25 a ticket if the rest of your family wants to spectate from the bleachers, it looks like an easy money grab. But the math doesn’t support it. Glendale, the opening round of 2019, had 712 entries and 425 unique riders. The second round in Anaheim had 784 entries and 484 unique riders. Many factors play into renting major sports stadiums. One executive in the Bay Area said, “A general rule of thumb is $150,000 every four hours.” Another said $250,000 for a full day. Add up the entry fees from Glendale and, assuming every rider bought one mechanic’s pass and estimating that 1,000 spectators paid $25 to sit in the stands, the revenue comes out to $112,510. Do the math for round two: $121,840. Representatives from Feld would not say if they are losing or making money on Supercross Futures, but they are building, literally, toward a better future. “It’s definitely not a financial play,” Prater said. “It’s a play for the long-term health of the sport.” Feld is the largest live event producer in the world and has the longest running partnership with the Walt Disney Company of any other company (Disney on Ice, anyone?). An internal anecdotal tale goes like this: Once, Disney’s then-CEO Michael Eisner watched a live event with Kenneth Feld, founder of Feld Entertainment. Eisner liked what he saw but had a lot of recommendations. Not demands, just recommendations. They watched another show together a year later, and Eisner was stunned that every single one of his ideas had been implemented. He gave Feld a 10-year deal to continue licensing the Disney name and properties. Feld is already looking 10 years into the future of dirt bike racing. They will continue to focus on branding and industry cooperation, but the Futures series is the first major push into developing talent and giving amateur riders more than just the experience of racing on a supercross track; they will now have a clearer path to racing professionally. In return, Feld gets the opportunity to keep their eye on, get to know and mold their future stars. Baseball didn’t get Little League until 1939, 70 years after the earliest professional team—the Cincinnati Red Stockings—first played. The Junior Football Conference, later rebranded as Pop Warner, started with just four teams in 1929, more than 45 years after the sport went through myriad regulation changes to evolve from a form of rugby into what we now know as American football.